The PMO Global Awards is the PMO Global Alliance’s annual award for the most outstanding Project Management Offices in the world. This non-profit initiative intends to inspire organisations around the world to evolve their Project Management Offices and project management practices to achieve the best results. It encourages organisations from all over the world to share knowledge and experiences, acknowledging best results, and allowing the evolution of the PMO worldwide community. The PMO Global Awards have PMOs from 64 countries on five continents, recognising and encouraging organisations around the world to achieve better results. The whole evaluation process is online. 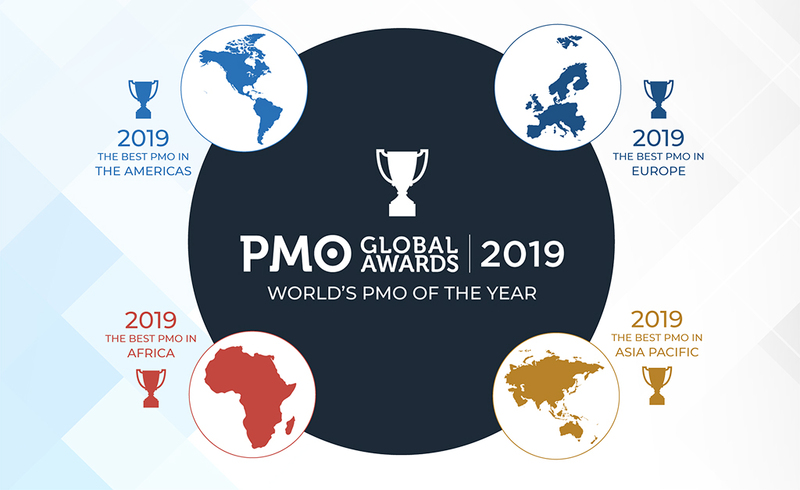 The four finalists, representing their regions (Africa, The Americas, Asia-Pacific, and Europe) will be honored at the Awards Ceremony when the the World’s Best PMO 2019 will be announced. The PMO Global Awards 2019 will take place on Thursday 17th October 2019 at FuturePMO in London. PMO Global Alliance was founded in 2014 and it is the first global community exclusively focused on Project Management Offices. It was created by Brazilian PMO Leaders who wish to exchange experience and knowledge in order to achieve better results in their PMOs.